Home » How to Import and Edit FLV in Final Cut Pro (X/7/6)? A .flv file is an Adobe Flash file that are becoming less common as many sites move to HTML5. However, if you have saved or download a file as .flv file, it will has no trouble playing them with some video players that support FLV format such as the popular VLC. You can learn 3 ways to play FLV in this Wikihow page. When it comes to editing FLV in Final Cut Pro (X/7/6), the problem won't be solved easily cause no version of Final Cut Pro supports .flv format file. Normally, FCP X/6/7 support Apple Animation Codec, Apple Intermediate Codec, Apple Prores, AVCHD, DV (including DVCAM, DVCPRO and DVCPRO50), DVCPRO HD, H.264, HDV, QuickTime, REDCODE RAW (R3D), XAVC (including XAVC-S), XDCAM HD/EX/HD4222, XF-AVC, etc. You can learn the specified supported media formats of Final Cut Pro in the page of support.apple.com. In the list of Final Cut Pro (X/7/6) compatible video format, there is no FLV file, which means that you can't import FLV to Final Cut Pro (X/7/6) to edit. Fortunately, with the help of a video converter, you can convert FLV to Final Cut Pro (X/7/6) accepted video format. Many Mac video converters are floating there. Pavtube Video Converter for Mac will be recommended in light of video conversion speed, output video quailty, intuitive interface to make the operating process easy. The decent FLV to FCP video converter can change FLV video to QuickTime MOV, Apple ProRes for FCP. It also outputs FCP optimized preset. It can convert FLV to Apple ProRes 4444, Apple ProRes 422 HQ, Apple ProRes 422 LT, Apple ProRes 422 Proxy, Apple ProRes 422 according to your Final Cut Pro version. The video conversion process will be easy and fast. The excellent FLV to FCP converter allows you to alter the output frame rate, the audio quality, the audio sample rate, the video size and the clarity degrees. 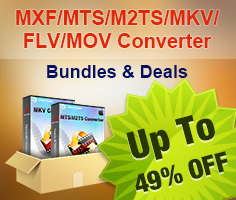 Though there are other converts that allow you to do similar things there are few that offers such detailed customization which is why you should try this program if you are looking to convert your FLV files and you wish to maintain a certain level of control. Before output ProRes for FCP from AVI files, you also can trim, crop, split, merge, flip, rotate FLV video, add subtitile/watermark to FLV video, add special effect to FLV video, adjust FLV aspect ratio, etc to get a perfect ProRes clips for Final Cut Pro X/6/7. After the installation of this FLV to FCP software, click "File" button or drag & drop the FLV files you want to convert to the program. All added files will be displayed on the left item bar. On the Play window, you can preview the movies and take snapshots as you like. Pavtube Video Converter for Mac supports batch conversion, so you can add multiple FLV files to batch convert FLV to ProRes for FCP. Apart from FLV, Pavtube Video Converter for Mac also can convert VOB, H.265, ISO, MXF, MTS, AVCHD, M2T and BDMV to Final Cut Pro X/6/7. Clicking "Format" bar and choose Apple ProRes 422 (*.mov) as output format from the "Final Cut Pro" category which can be the most compatible video format for FCP. Learn>>Types of Apple ProRes Codecs. 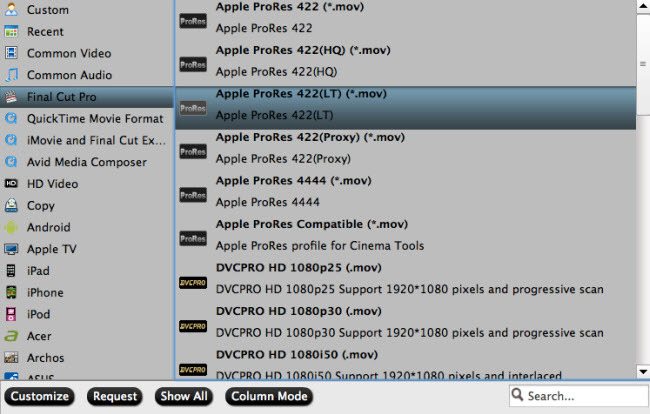 Tip: FCP 7 and above user can choose ProRes 422(LT)/ProRes 444/ProRes 422(Proxy) to meet your own demands. Note: Please make sure you have installed ProApps QuickTime Codecs, or you may get files with sound only without video when converting VOB to FCP X. Tip: Click "Settings" to fix the frame rate, bitrate, video size, etc to your needs. If you want to edit in Final Cut without having to render the clips while editing, all the frame sizes must be the same as the sequence settings. You can save a lot of render time by making all the clips the same size with this Mac FLV to FCP converter. When the settings of output format are done, click "Convert" button to start converting FLV to FCP friendly videos. After the conversion completed, you will find the converted Final Cut Pro files in your destination folder. Launch Final Cut Pro on your Mac and simply import the videos to FCP, then you can edit the converted FLV videos with your Final Cut Pro. How to Export a Project in Final Cut Pro? After edited converted FLV video in FCP X/6/7. You can export your video copy from Final Cut Pro following the steps in the page documentation.apple.com. I have extracted the main steps below. 1. Control-click the Final Cut Pro project asset, then choose Export from the shortcut menu. 2. In the Export Final Cut Pro window, choose a location to save the exported Final Cut Pro project file and its media to by clicking the Choose button and identifying a location in the file browser. Note: To avoid losing track of exported projects, you can create a “Checked out Final Cut Server Projects” or similar folder on the desktop or in another convenient location. 3. If the Edit Proxy feature has not been turned on, original media will be used by default. If the Edit Proxy feature has been turned on, choose Original Media or Edit Proxy from the Use pop-up menu. This defines the media type that will be used while you’re editing the project. 4. If you want local copies of the media used in the project, select the Keep Media with Project checkbox. 5. Click the Export button. A copy of the project file is exported to the location you specified in the Export Final Cut Pro window. You can export video these video formats from Final Cut Pro. FLV is an ideal format to upload video to video sharing sites. So when you want to upload FCP video to FaceBook, YouTube, you can convert FCP export to FLV format. 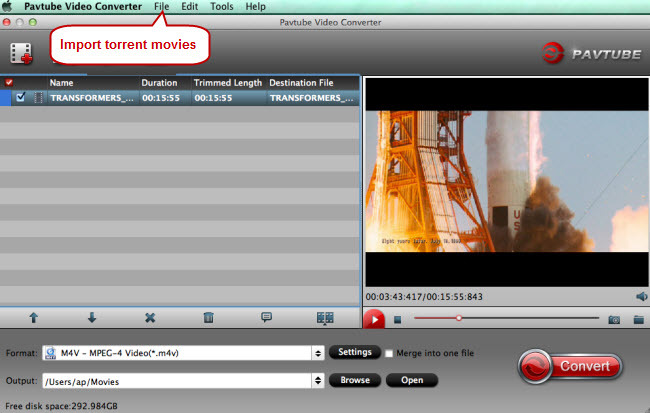 Pavtube Video Converter for Mac not only can convert FLV to FCP X/6/7, but also can transcode FCP video to FLV easily. Just drag and drop Final Cut Pro export video to Pavtube Video Converter for Mac and choose FLV format in "Common Video". Finally, start to convert FCP video to FLV by clicking "Convert" button. Done! How to Play AVI Videos on MacBook(Air, Pro, iMac)? How to Import Android Videos to iMovie for Editing?